I feel like a disgruntled suburban parent when I talk about Christian music, its not that I'm mad at the genre, it is just that I am very disappointed. I have always felt that if your music centers around something as powerful as the existence of an all loving, all knowing and all controlling God, then your music should have some sort of emotion behind it. If you sincerely believe with all of your heart that that you were predestined to make music for this LORD, that the LORD loves every person with all his heart, and that you want to "bring as many" people to this LORD as possible then you should have some sort of emotion and divinely inspired creativity in your music. Even though Christian artists claim that they believe in all of the things I listed above, their music usually never gets past their niche audience because of cliched songwriting, lack of emotion, lack of creativity, lack of talent, and lack of consistency. In fact, the only consistency about Christian rock is that it will sound like it was made out of some weird obligation instead out of some divinely inspired period of creativity. 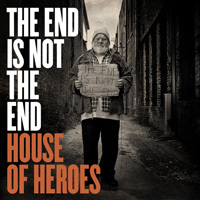 House of Heroes have always been the one exception in the Christian rock genre and they prove this on their 2008 near masterpiece The End Is Not The End. The first thing The End Is Not The End does that most Christian Rock albums fail miserably at, is it sets up a desperate relationship with a character and God. Instead of just claiming God to be awesome, brilliant and a creator, House of Heroes use World War II to show how powerful they believe God is. The End Is Not The End is a concept album that has stories of love, endangerment, death, politics, desperation, loneliness, depression, bombs, heartbreak and poverty. The reoccurring theme that runs through The End Is Not The End though is that even through all of this struggle and strife a powerful, loving, and caring God remains "by his side:" he finds God loves in the terror of falling bombs in "In The Valley of the Dying Sun," he finds that God is with him and caring for him even in the most "Dangerous" moments, he finds that God is with him in this life and the next life on the beautiful "By Your Side," and he finds that God is with him in even the most desperate endings to war on "Field of Daggers." The End is Not The End is what every Christian rock album should be conceptually: it is an album that not only tells us that God is awesome, caring, and omniscient, but gives us reasons and stories that make us believe that he actually could be, it not only says that God will help us but it gives us stories how God helped the main character in this story in even his bloodiest battles, and it not only gives praise to something it believes is all powerful it shows us why we should be giving praise to this God and why he is all powerful. Christians will tell you that their faith is based on a unique individual relationship with God that goes beyond love, they will tell you that their relationship with God is based on the fact that he has always been "by their side" in even their most complicated battles, and they will tell you that their belief in God's existence is based on a "blind faith" that is inspired by the beauty of nature, the beauty of the people in their life, and the beauty of what he supposedly sacrificed for them. If these are the tenants of Christianity and the reasons why it is such a popular and inspiring faith, then The End is Not The End is finally the perfect Christian rock record because it is the first Christian rock record I have heard that is not only aware of this unique relationship but can make the listener feel like they are part of this relationship as well. It is also very important to point out just how superb the musicianship and how great the songs on The End Is Not The End are. The album musically has the rock opera sound that combines the energy of A Night At The Opera with the pop-punk sounds of The Black Parade and this allows the album to give us several breathtaking moments musically: the chaotic breakdown to "In The Valley of The Dying Sun" features guitar work that is so piercing and unique that it almost sounds like thousands of bombs are falling upon you, "Field of Daggers" is the albums attempt at a "Bohemian Rhapsody" as it features several instrumental layers and many unique parts, the chorus to "Dangerous" is the most blunt and rocking moment of the album, and "Sooner or Later" is the albums most effective and catchy song. What makes the instrumentation on the album so remarkable though is how it never interferes with the story and always enhances it: the instrumentation gives us the loud choruses that make us feel like why are on the "front lines" with the narrator of the story, the fast drumming that gives us the albums breakdowns makes us feel like we are experience the love, heartbreak, and tragedies that all of the soldiers in the story were facing, and the general "rock opera" feel of the album makes it feel more like a story than a collection of 15 songs and that in itself enhances the quality and importance of each of the albums 15 tracks. And even separate from the concepts of the album some of the tracks on this album are absolutely remarkable: "Sooner or Later" is one of the catchiest tracks I have ever heard regardless of genre, "By Your Side" sounds like the ballad that Springsteen and U2 always wanted to make, "In The Valley of The Dying Sun" is a powerful and spiritual experience, and "Code Name: Raven" is also one of the albums more superb tracks. I don't just think that The End is Not The End is a once in a lifetime Christian rock album, I think it is a blueprint for how every Christian rock artist should try to make an album. It is an incredibly emotional album that is artistic proof of how unique every Christian says their relationship with God is, it has a powerful story that goes beyond simply saying cliche stuff like "God has been good to me," it has seven of the best Christian rock songs you will ever hear, and it has such great instrumentation that it makes you feel like you are actually part of the story and you are experiencing the same God the stories main character is experiencing. The End is Not The End is not an album that is powerful enough to make you believe in God, because obviously it is going to take more than just one album to completely change your way of thinking. But The End is Not The End could be an album that makes you believe in something that could be far more irrational: it could make you believe that breathtaking, original, and unique Christian rock can actually exist.